“Myth” is a complex term. Not every false story is a myth. 2. time: set in the past or the universal present – the same thing said in a different way at the same time – or, more simply, the past is universally present. 3. subject-matter: themes are drawn from the realm of the non-verifiable, or at least from that which was incapable of demonstration at the time of the creation of the myth. expressions of the collective story of an age. A myth is living or dead not true or false. We cannot refute a myth because as soon as we treat it as refutable it is no longer a myth but has become hypothesis or history. 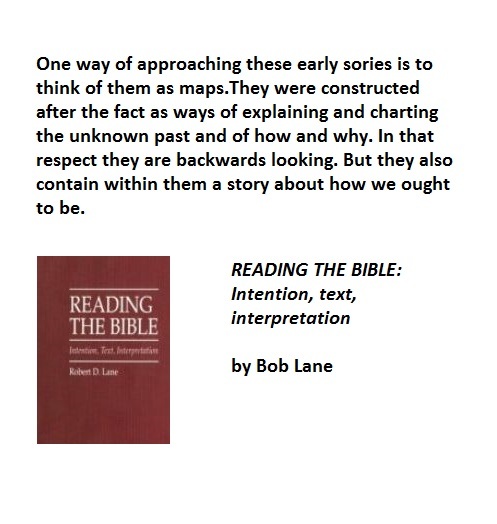 We need not believe everything we read in the Bible as literally true (because it is not), but it can be read as pointing toward a truth, or truths, about the human story. Sometimes we may smile at the naivete of the stories but we should never sneer at them. Often the seeming naivete is indeed just that, seeming. Myths are like parables – to be meaningful they must create their own lens for viewing the world. We see the world through these lenses.